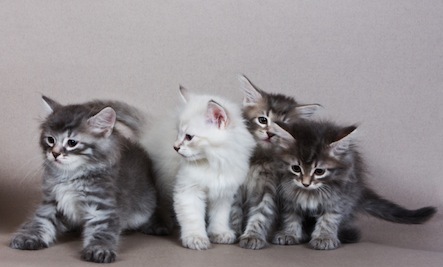 Wellington, Kansas passed an ordinance last month that regulates the number of cats each household can own. Families in the area are now barred from owning more than 4 cats. The new restriction matches the number of dogs each household is allowed. The ordinance also set conditions for adopted cats. Cats shall be vaccinated for rabies; they must also be spayed or neutered by a licensed veterinarian, unless the cat is being adopted to a home outside of the city, according to Wellington Daily News. While reactions to the ordinance are mixed, it remains unclear exactly how the new limit will impact the number of cats being euthanized. The point is nobody should be interfering with our personal freedoms, and to me how many cats I have in my own home is a personal right. Legislation goes to far. If our cats cause others issues, then address the problem if there is one. I'm gratified to read these responses by Antonella, Anji, Elisa and Susan P, Annalisa P and PrimAWAY B. Nice to know I'm not alone and that the consensus seems to be totally against arbitrary laws and rules against animal caretakers. Sure, there's the occasional 'hoarder' who somehow gets all the press--enough to make it seem as though he/she is the 'norm', but nothing could be further from the truth. The vast majority of animal rescuers/caretakers are people who simply love animals and cannot abide any form of abuse or animal suffering, so extend themselves to try to prevent it even if they aren't very wealthy. Rather than localities working with these people (like you and me), they pass these insulting and restrictive rules. I'd put money on most of the regulations being passed by those who truly do not understand the first thing about animals and their care. If I may be so bold, it brings to mind certain know-nothing and clueless males determined to pass arbitrary rules about women's bodies. Sounds pretty much the same thing--to me, and should be reacted to the same way--with much protesting--and at the ballot box. :) I'm not trying to get into a political war here--if you disagree with me, that's perfectly okay...we can agree to disagree. Just attempting a bit of levity! There are many people that can handle more than 4 cats and no one could even tell they had animals by walking in the home if kept up properly and actually that is quite easy. There are animals out there and if they can have a home ,they should.They also should all be spayed and neutered. if kansas made any law it would be to simply make sure that they are spayed or neutered. There are too many cats out there lost looking for a home or a barn to live in . You DO NOT capture or take them and kill them. TNR ,YES!! Absolutely brutal law. I'm against hoarding as we all are but certainly many people run rescues and have many fosters ,etc... in their home . All taken care of properly. I have more than 4 cats/animals and no issue at all. NONE!! This is absurd and unjust, luckily in Italy there are no laws so stupid all of us can have as many pets want, even if you live in an apartment. But in switzerland if you pay the tax on the dog. And if you do not pay, take him away and submit it to a municipal veterinary euthanasia. Elizabeth S: Waay back probably in the bottom of all of these comments I mentioned that they should also have laws against people having more human children than they can handle (such as the Octo-Mom). I totally agree with you. Some people just have compulsive hoarding behaviors such as having too many animals, things, or having/wanting too many children. It is a mental illness and should be treated. I would be much more for intervention in such cases than punitive laws. Just curious, but do any of the people here who think it's perfectly okay to pass ordinances in townships to limit numbers of animals to less than half a dozen EVER have anything to say about families like the Duggars with their brood of 18 (or is it now 19?) --and even televise it to influence others into doing the same thing? MY ALL RESCUED OR FOUND cats are small: the biggest weighs in at 14 lbs, the smallest at 6 (she's the elderly 21yr old and with a thyroid problem for which I give her meds every day it's work to maintain her weight although I feed her several times a day). She also goes into the vet twice a week to be helped in eliminating since her body doesn't function that well. She's not in pain--it's a common enough problem. When she gets home she's happy as a clam and bounces back to eating and interacting with her 'siblings'. When the time comes I'll know it (as I always have). A CHILD on the other hand, takes up vastly more space in a house--needs a heckuva lot more food, space, toilet facilities, education, etc. So why these ordinances against household pets while nothing is done about people who breed like rabbits? oh, and for the record? I don't live on a farm, but a suburban ranch house--3 bedrooms, 2 baths, tile floors throughout. We have a half acre and DO take extremely good care of our home. The bay window looks onto the bird feeder: kitty tv as I call it. It usually fits at least 4. People shouldn't comment if they've no idea how to live in a multi-pet household. If my husband wasn't here to check me, I'd be fostering those animals who can't find permanent homes. My two dogs were rescues--given up by their previous families. Mine became their forever home. No animal will ever 'not work out' within the walls of my house and no one but no one can tell me how to do it. I'm somewhat of an expert at this point. My beautiful Eskie who just passed away was loved by the three vets who took on the rare disease she was afflicted with. One made a donation to Cornell in her name after she passed and we got condolence cards from so many veterinary people about how amazing they think we are. Now tell me how 'wrong' I am for having more than 4 pets. (cont'd): Group by group I got them in to spay/neuter and release (hubby's orders). Then some began dying--a crazy neighbour was putting out poison. I couldn't tolerate it. By that time 8 were left. I took them ALL in--so now had 14 cats--a couple more litter boxes which took a lot more time to clean. None went out, all spayed/neutered--people who came said they'd no idea I had cats at all--and yes, it can be done if you have tile floors. Eventually some died of old age, we rescued a dog who fell in love with a couple--the rest would avoid her. She passed on too. We then later got another dog who got along fine with the remaining 8. She and two of my older cats have just died. One was 21. Her sister is still going strong at 21-l/2 (in people years). The other 5 are all older than 13. I know they'll break my heart sooner than later--and you've no idea what my vet bills have been over the last couple of years--I could probably have built a new house, but that wouldn't have brought me the joy I've gotten from my fur babies. Does anyone really need more than 4 cats? Where I live they regulate how many dogs you have...am not sure about cats, although unless you live on a farm, I wouldn't think you would need more than 4.